The Plot (Courtesy of TV.com): J.R.'s flirting with Afton at Lucy's wedding sends Sue Ellen after an old boyfriend. Jock upsets Miss Ellie. In our last Brief Dallas Interludes, J.R. had been shot and was lying in a hospital bed unsure of who exactly had shot him. As we jump quickly back into the world of Dallas, we see that, even though that was just a few months ago, quite a lot has changed in this world. For instance, in that last Interlude, we were not yet aware that Ray Krebbs was actually a Ewing, that Jock was his illegitimate father, but now that information is out and about and the characters are all discussing it. Or, for a better example, last time we had an Interlude, Lucy was just meeting Mitch for the first time, and now here she is getting ready to walk down the aisle with him. A quick note about the episode, as well. You’ll notice that I am not writing about End of the Road: Part One. The reason for that is because this did not originally air as a big two-hour double block of television; rather, the two episodes aired as singular entities one week apart from each other, so I don’t believe I need to see Part One to write about Part Two. Secondly and more importantly, neither Gary nor Val appear in Part One, so it simply doesn’t count as part of our Interlude series. Okay, moving on. Honestly, this may very well end up being the briefest of the Brief Dallas Interludes, mostly because Gary and Val don’t have very much to do within the confines of this ep. The majority of the episode focuses heavily on Lucy’s wedding, obviously, but we also have some storyline going on involving Bobby making a business deal or something. 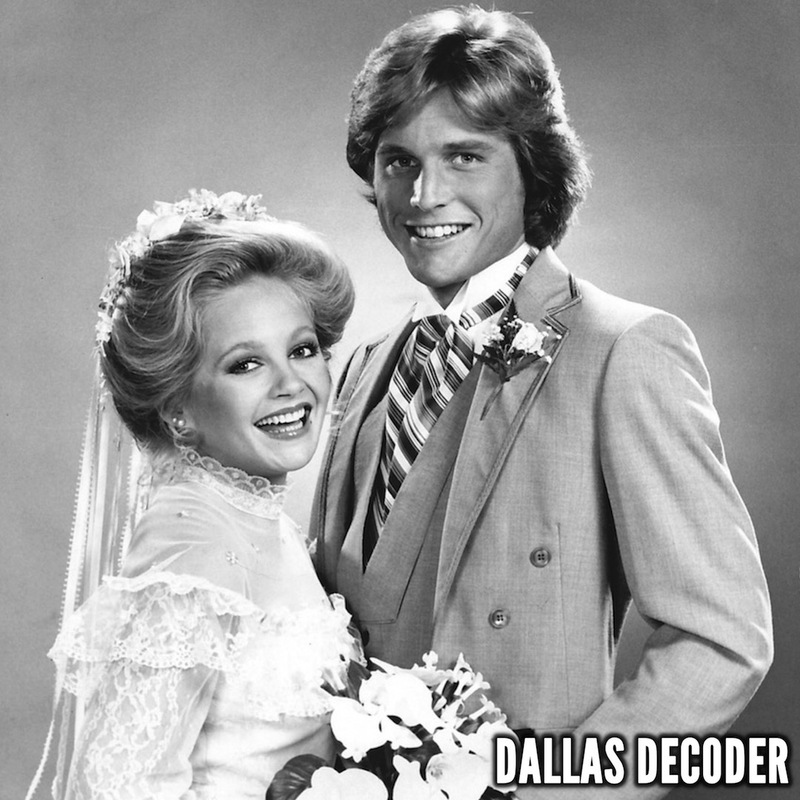 I will say that while I am glad I’m doing these Dallas eps as they come along, sometimes it’s a little bit weird to jump from show to show and return to the Dallas world. Even though I’m really only interested in writing about what Gary and/or Val do within their appearances, I still find myself trying to remember what was going on in the overall storylines on the series, so I’m like, “Why is Cliff dating Donna?” and stuff like that, things I’ve forgotten about even after viewing the entire Dallas series (twice, actually). In any case, I’ll give you a really speedy update. As we start the episode, we see that the wedding of Mitch and Lucy is in turmoil; perhaps they won’t get married after all. Mitch is talking to his sister (Afton, who will become a pretty important character in Dallas) and his mom (Anne Francis from Forbidden Planet) about why he and Lucy are splitting up, that it just won’t work. Well, after Lucy shoves him in the pool, he changes his mind and they decide to get married and most of the second half of the ep is about that wedding. Sure, there’s stuff going on with Sue Ellen (she’s considering an affair on J.R.) and Bobby (who is trying to run Ewing Oil and is finding himself in J.R.’s shadow) and pretty much everyone in the cast. But this is a KL blog, not a Dallas one, so let’s just ignore their storylines, shall we? Miss Ellie and Jock show up at the airport to meet Gary and Val. It was here that I really perked up and started paying attention; I wanted to see if any of the storylines from over on KL would be mentioned, if perhaps we’d get some small hint of Gary’s recent infidelity with dykey-looking broad or a mention of J.R.’s recent trip to town, something like that. You’ll recall that our last two Interludes linked rather heavily into KL by having Gary mention KL characters and talk in some detail about his troubles going off the wagon. This ep is not nearly so linked, however. Gary and Val come to see Lucy get married, and that’s about it. Not to say I’m necessarily complaining; I still love the fact that these crossovers feel so organic. They do, too, because other shows would probably just be like, “Here are two characters showing up from the spinoff; please watch the spinoff on Thursday nights,” but here, it doesn’t feel like tacky cross promotion. It’s Lucy’s wedding and of course her parents would show up to see this event. 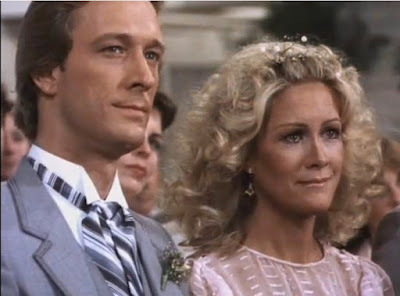 Even if you were watching Dallas and were completely unaware that there was a spinoff, you wouldn’t question Gary and Val’s presence in the ep because it makes sense for the story. The fact that Ray Krebbs has been revealed as a Ewing also plays somewhat into our beloved KL characters. When Gary speaks to Ray about the recent announcement, he basically says that this is great because it means he can stay in California and Ray can sorta fill the hole in Miss Ellie’s life (oh wait, that sounded dirty). Obviously this does not please Miss Ellie, who later takes Jock aside and says she’ll “Never forgive him for what he’s done,” essentially blaming him for Gary staying in California. This is a bit perplexing to me for a number of reasons, by the way. In case I haven’t mentioned it, Miss Ellie is easily my least favorite character from the entire original cast of Dallas; I just think she’s a boring old hag with an annoying voice. Well, I suppose that’s not particularly important to my next point, but here it is: Why the hell is Miss Ellie so obsessed with Gary moving back to Texas? Did she not buy him a house in California and tell him it was specifically so he could start a new life out there? Now here we are, just a little over a year later, and she’s all heartbroken that he’ll be staying in California. Huh? Isn’t that what you wanted? And why blame Jock for this? Gary was gonna stay in California no matter what; it doesn’t matter at all that Ray is now a Ewing. Gary has his own show and its ratings are increasing (slightly, very very slightly), so he’s sticking to that series, dammit! Oh yeah, and one last note: Why doesn’t Miss Ellie just, you know, fly to California and see him? It’s not like she’s busy; she’s a wealthy woman who sits around the house all day, and she has plenty of spare time to pay her son a visit, particularly since she whines so much about him not being around. I enjoyed seeing Lucy getting adorned in her (actually quite ugly) wedding dress, and I think there’s some line about this being handed down from generation to generation, although I may very well have hallucinated that particular line. Mostly this scene is good just to see Lucy and Val standing next to eachother, and I had a realization as I watched this: This is the very last time we see Lucy and Val together ever. Valene only appears in two more eps of the series, our next Interlude, The Split, and then she won’t be making an appearance on Dallas again until the very last episode in May of 1991 (over ten years after the airing of this episode), and when she does appear, not only is Charlene Tilton no longer a cast member on the show, but even if she was, I don’t think we would have footage of them together based simply on how that episode of Dallas plays out (and fear not, for we will be discussing that one in, oh, a couple of short decades). Also, we’ve already had our one and only appearance from Lucy crossing over to KL, and that was back in Home is For Healing. So really, this is a moment to be cherished, as we shall never see the mother/daughter pair onscreen together, which is pretty weird to think about. Reflecting on the two actresses, I’ll take a quick moment to say the casting was just perfect on both ends, as the two really do look like mother and daughter and they also look so close in age that it’s easy to believe Val had Lucy when she was very young. Another lovely moment occurs when Gary proudly walks his daughter down the aisle. Now, I don’t think what I said about Lucy and Val holds true of Lucy and Gary. Gary will be showing up five more times on Dallas, and I am fairly certain we get scenes of him and Lucy together in at least a couple of those appearances, so when we reach those, I’ll try to note when we are seeing their final scene together as father and daughter. In any case, it’s not here. So jeez, what else to say? I would say this is very much a Dallas episode and the appearances of Gary and Val are just there because they make real sense for the story. Sure, I’m willing to bet that the writers and producers were, again, hoping to strike up interest in the spinoff series by putting the two characters in this episode, but it doesn’t feel tacky the way, oh, the episode Kristin felt tacky; this one just feels natural. I definitely think that if a viewer watched both A Family Matter on Thursday and then End of the Road: Part Two on Friday night, they would probably be tempted to devote fully to both series, as they are both pretty good eps that signify the two series doing solid work. I would be very curious to get an episode-by-episode listing of the ratings for all KL eps and see how eps that aired immediately after a Dallas Interlude ranked in the overall ratings. I’d be willing to bet that if Gary and Val showed up in a Dallas, there would be a spike in the ratings of the very next KL ep, whatever one it might be, but I currently have no way of knowing this for sure. Anyone who has access to such information please feel free to contact me. The last thing I want to say, and this is a bit of a revelation for me, is how much more I am enjoying KL over Dallas even at this early point. If you’ll recall, I believe I said that during seasons one, two, and three of KL, Dallas was the superior series on television at that point (it would be, for Dallas, seasons three, four, and five), but now I don’t think I believe that anymore. Whenever we jump into A Brief Dallas Interlude, I just find myself less interested and a bit eager to return to the world of KL. This is very odd, as I absolutely remember the first three years of KL being my least favorite, but upon this rewatch, I already am finding KL to be the superior show. Jumping into Dallas, it just seems less interesting to me, not just in the writing, but also in the very way the show looks. It’s just shot kinda drab and I have zero interest in quite a few of the characters (not to beat a dead horse, but Miss Ellie, again), whereas with KL I love all the characters (sans Kenny and Ginger, of course). Anyway, don’t mistake this for me calling Dallas bad, because I’m not. I’m just observing that, for me, KL is already the superior, more mature, and more interesting show. That oughta do it for awhile as far as Dallas eps. We won’t have another Interlude until very late in 1981, when Dallas is in its fifth season and KL is in its third (we actually get two Dallas eps in a row, and they are The Split and Five Dollars A Barrel). That’s a ways away, however, so for now we’re gonna return to our beloved friends on the cul-de-sac with our next KL episode. Originally airing Thursday, January 29th, 1981, our next episode up for discussion is called Choices and I will speak to you then. REUNION: PART ONE, REUNION: PART TWO, SECRETS, RETURN ENGAGEMENTS, NO MORE MISTER NICE GUY: PART ONE, NO MORE MISTER NICE GUY: PART TWO, THE SPLIT, FIVE DOLLARS A BARREL, JOCK'S WILL, THE FAMILY EWING, AND CONUNDRUM.